Sgt. Star is a 6-foot-1, clean-shaven, strong-jawed white male, with eyes that match the camouflage pattern on his combat uniform. His voice is deep, authoritative and carefully enunciative. He seems to be in his 30s, but he is actually only about 7 years old. Sgt. Star is not a real person, or at least not a corporeal one. He is a chatbot—an artificial intelligence program designed to hold conversations—that was commissioned by the U.S. Army to help with recruitment efforts. 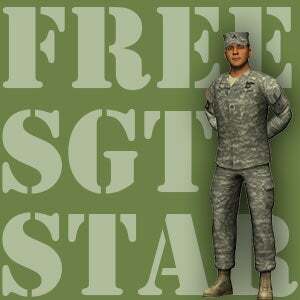 He can recognize questions and dispense answers, verbally and in text, and also help the user surf the GoArmy.com website. According to marketing materials, he has answered more than 11 million questions so far. Last year, we filed a request with the Army to see if we could obtain him, or elements of him, through the Freedom of Information Act. More than 75 calendar days have passed and the Army still hasn't responded, not even to say they're withholding the records. Contemplation of military service is one the most personal and life-altering decisions an American can undertake, with lasting consequences. We are interested in learning how Sgt. Star works, what questions he was programmed to answer, and whether the Army has found the project effective. As electronic privacy advocates, we also hope to determine what happens to the records of conversations Sgt. Star has with potential recruits. As chatbots grow in popularity, particularly in a commercial setting, Sgt. Star is often pointed to as a successful model of how this technology can be used as a replacement for humans in providing customer service. The SGT STAR project (officially, it's all-caps) began in 2007 with a partnership between US Army Accession Command and the Spokane, Wash.-based company Next IT, which sells "intelligent virtual assistants" to businesses. In the year since Star's inception, he has expanded beyond his GoArmy interface and potential recruits can now interact with him through Facebook or download him to their mobile phones via an applaunched by the Army last year. Sgt. Star also makes appearances at public events, such as NASCAR races and Future Farmers of America gatherings, where users can talk to a full-size projection developed by the Institute for Creative Technologies at University of Southern California. We contacted programmer Bruce Wilcox, two-time winner of the Loebner Prize for Artificial Intelligence(a.k.a. "The First Turing Test") for advice on what to ask for in a FOIA request. Wilcox suggested we seek Sgt. Star's input patterns (all the phrases and keywords Sgt. Star is pre-programmed to recognize) and the scripted output answers (all the possible things Sgt. Star could say). In our FOIA letter, we requested these files as they existed for each year between 2007 and 2013, so we could compare how Sgt. Star's answers evolved to reflect developments in global conflicts, changes to military benefit packages, and new policies, such as the repeal of "Don't Ask, Don't Tell." To cover our bases, we widened the FOIA request to include all contracts regarding Sgt. Star, all annual and quarterly reports that reference Sgt. Star, any audits, and any privacy policies associated with the program. We also asked for whatever analytical data might be available, such as the number of conversations Sgt. Star has had, the duration of those conversations, the general geolocation of the users (broadly), the number of conversations that resulted in direct communication with a human recruiter and any estimate of manpower saved by using the AI. Once we crafted the request, the next challenge was to determine which agency was responsible for Sgt. Star. With the disestablishment of the Accession Command in September 2012, it was unclear which division had inherited Sgt. Star. We started with the public affairs office of the U.S. Army Recruiting Command (USAREC) in Fort Knox, KY. From there, our request bounced to the Army Marketing and Research Group, a new division created in October 2012. A representative initially said they would follow-up in a week and get us whatever they could. That was last November and we have yet to receive any further response, despite a follow-up letter we filed shortly after the Army missed the 20-day FOIA response deadline. We even sent the Army a note that we were writing this blog post. The Army can't argue that none of the records we requested can be released. Sgt. Star's individual responses are already publicly available on the Internet, provided a user enters all of the possible questions into the chat interface, so there's no reason the script should not be available in aggregate. Next IT uses basic Sgt. Star statistics in its marketing materials. For example: the program has a 94-percent accuracy rate in answering questions and the average user interacted with the program for 10.4 minutes. The fact that a private company can access this data, but the public cannot, raises questions about both privacy and government transparency. When the Army Marketing and Research Group was founded, the division's director, Mark S. Davis, said its mission was to "make the Army more transparent to the American public; explained in a way that is accessible and shows how truly extraordinary the U.S. Army and the American Soldier are." If he still believes that, his office should let the American public see how truly extraordinary the Army's virtual recruiter is by responding to our FOIA request. This post originally appeared at The Electronic Frontier Foundation. It has been republished with permission.